When I was young I listened a lot to Vocal House. At this time lots of great tracks full of pain and melancholy been released and you could perfectly dance to them. With Disco music it was the same. It is a matter of records that Torch songs spread the biggest emotions says Hercules and Love Affair singer, producer, and stylistical mastermind Andy Butler about his musical love affair and the emotions on the latest album of his band. 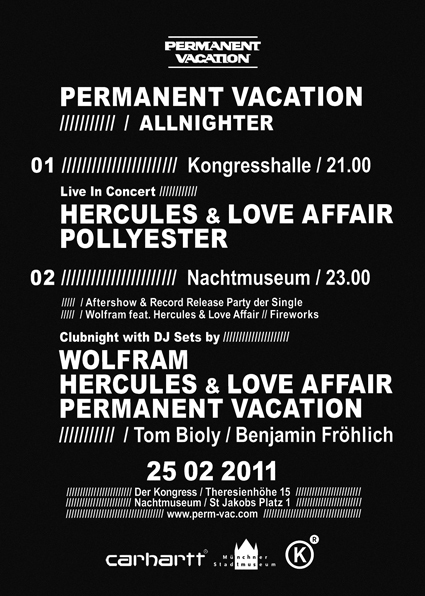 Upcoming Friday they will electrify Munich with their moving Torch songs and other House and Disco delicacies live at Kongresshalle. After the show Andy Butler and his vocalist Kim Ann pack their record bags to join our friends from Permanent Vacation and their latets signing Wolfram for a sweaty after show party. If you like to dance in model-like poses and shake your body with angular, linear, and rigid arm and leg movements, then both events are a duty call.